Last night, I got a sad phone call from Kris. My beloved car, Alice, was about to be towed to a salvage yard in the Pasadena CA area, he said. I stayed on the phone a long time with him, talking about Alice. He was as bereaved as I. He too loved her deeply, though he’s only owned her for four years. We discussed Alice’s virtues: her lean, polished body; her never-repaired transmission; her amazing 445,000 miles of service; her willingness to go above and beyond; her responsiveness to being talked-to, being thanked, being loved-up. We lamented, too, Alice’s deficits: her motor heart which was finally giving out; her absence of air conditioning and CD player; her cracking vinyl dashboard. But mostly we talked about her personality—how she was a soldier-servant, an old-fashioned warrior really, loyal far beyond the call of duty on the highways and byways of America. And I believe Alice was happy—you could tell because she often purred when she’d been oiled and tuned. Alice, age 28, on April 6, 2016, calmly awaiting a tow to the car graveyard. And lest you disbelieve her specialness, I must tell you that Alice truly had her proverbial 15 minutes of fame in the world! How? you ask. Well, believe it or not, Alice and I were featured in The New York Times of September 27, 2002 in the Travel Section, page D1, in an article by Janet Ruth Falon. On page 9, there was a four-column-wide picture of the two of us—I sit with my arm on her steering wheel. But how that all happened is another story—it’s not for now. 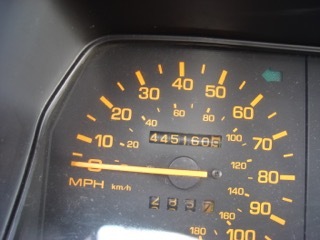 Twenty-eight years ago I purchased Alice, my one and only brand-new car, from Bott Toyota in Germantown, a seedy, historic section of Philadelphia. 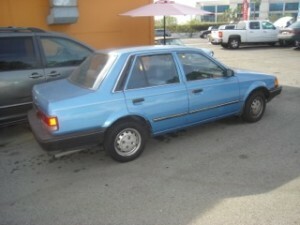 Alice was a 1988 Mazda 323. She was blue, sunny-sky blue. Blue-tweedy interior. Stick shift. Huge trunk. She was beautiful then, as she still is now on the cusp of her transition into spare parts. “She”? Yes, very early on in my ownership, I named her Alice because I knew she would take me to Wonderland. Where was Wonderland? I wasn’t sure in 1988, but I knew Alice would carry me to adventure. It turned out to Wonderland was California. For years I kept all of Alice’s records in a tidy file folder: purchase papers, dealership oil change and maintenance receipts, replaced windows receipts (oy! I lost track of how many times I replaced her windows, for I worked in a seedy section of Philadelphia, too), new tires, repaint job, new fender, exhaust emission tests. Finally, when in August 2012 I gave Alice, now happily humming in California—age 24 at mileage 350,000—to Kris (who was underemployed at the time and desperate for a vehicle), I tossed all those papers. I shoulda kept ‘em. I would have liked to review them as I write this obituary. For in my 24 years with her, Alice and I (sometimes with my young daughter) went across America and back—ocean to ocean—I’d say, oh, maybe three times. She made multiple trips from Philly to Kansas (where my family lived) and from Philly to Indiana (where my daughter went to university). Alice went to the Jersey shore for fun, to New York City for museums, to Washington, DC for demonstrations, to the Pennsylvania countryside for countless weekend vacations. Day after day after day, she went to work, cooperatively. Then when I moved to California, she went up and down the California coast and into Oregon, making countless forays on the interstates freeways—clogged or free-flowing. She knew mountains and seashores, deserts and cities, dirt roads and superhighways. She was a survivor. Alice hauled lumber; she carried heavy boxes; she pushed stalled cars out of busy lanes and towed broken vehicles. She survived being stolen—being hot-wired, driven to the other side of town, and then rescued by the police. She survived having her door locks tampered with. She endured fender-benders and parking scrapes. She recovered after getting her driver-side door smashed when I backed up into a garage doorjamb. She rescued people; she picked up a few hitch-hikers; she served tourists; she ferried school children. Once—I hate to think about this even now—she hit a kid, a teenager who was recklessly bounding across a street against the traffic light on one of those November days when it gets dark so early. That was one of Alice’s worst days, and mine, for sure. The teenager survived, but both Alice and I trembled. 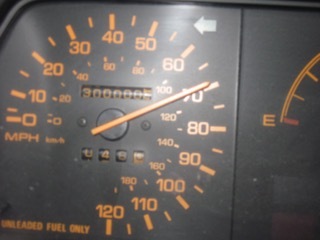 When Alice became 300,000 in January 2009, I started taking pictures of her odometer. Below you can see I got the photo just as 299,999 vanished—I was going 70 mph on the I-10 in SoCal, with someone close behind me and I couldn’t pull over right then. That’s why it’s blurry. When Alice turned 300,000 in January, 2009, I was driving 70 mph but I captured the moment! I don’t have early pictures of Alice I can post here—she was born before the digital age—but you’ll have to take my word for it: she never changed much over her 28 years. Now, I wonder, are there poems memorializing cars? Songs? There must be. I just don’t read enough poetry or listen to enough pop music to know. But let it be said: Alice was my most constant companion for many years—my transport to hours and places of joy, my haven for sobbing and prayers, my portable meditation space. I thank Mazda for designing her, I bless all those anonymous assembly-line workers for making her, and appreciate all those mechanics who maintained and repaired her. And I love her still.